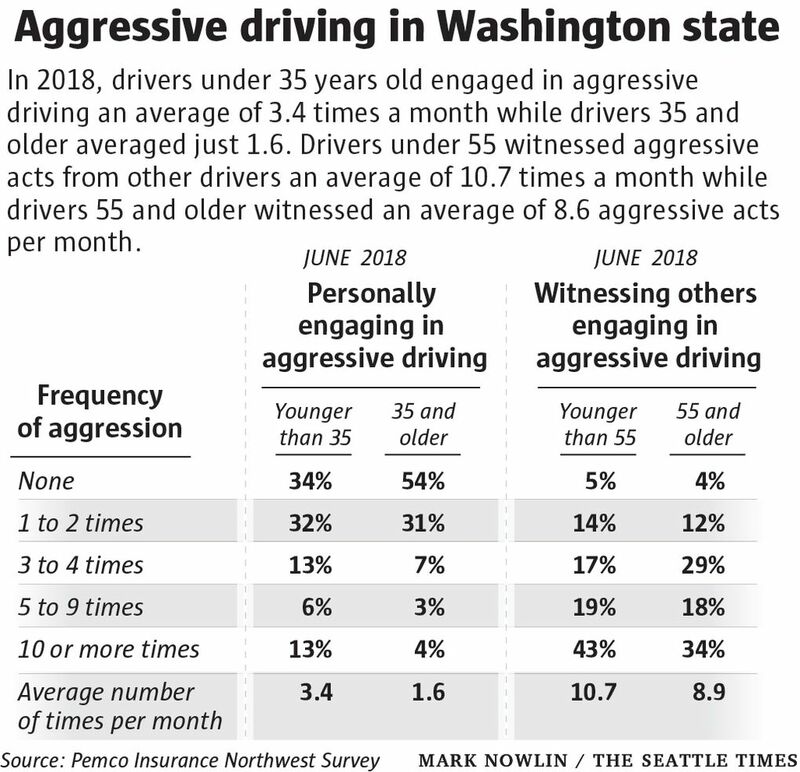 A new PEMCO Insurance survey shows that Northwest drivers increasingly believe that both they and their fellow motorists are more aggressive on the road than they were four years ago. But most people seem to think other drivers are worse than they are. On the other hand, Foreman, 25, said she can see how someone else on the road might describe her as “aggressive.” And she says she’s noticed more aggression in other drivers since she moved to Seattle four years ago. Foreman’s experience is backed by the results of a new PEMCO Insurance survey showing that Northwest drivers increasingly believe that both they and their fellow motorists have gotten more aggressive on the road. In PEMCO’s poll, drivers in Washington and Oregon admitted to acting aggressively about 2.1 times per month. That’s up from an average of 1.3 risky behaviors per month reported in 2015, the last time the insurance company conducted this survey. But people seem to think other drivers are the bigger problem. Nearly 80 percent of drivers reported that they, personally, were not aggressive but that they’d witnessed other people being more aggressive than in the past. The rise in aggressive driving has not gone unnoticed by the Washington State Patrol. Troopers began an emphasis patrol this week in Pierce County. The weeklong campaign targets motorist moves that add risk and rage to the roads, including speeding, changing lanes recklessly, tailgating, and failing to use the left lane for passing only. In the PEMCO survey, millennials admitted to more aggressive behaviors on the road than their older counterparts did. Drivers younger than 35 admitting to an average of 3.3 risky maneuvers per month, while those older than 35 reported they’re aggressive on the road just once a month. Derek Wing, a spokesperson for PEMCO, said the reasons for the age discrepancy aren’t clear. Do millennials have a greater need for speed as a result of impatience in an instant-gratification society — or are they just more honest? Overall, many factors could be contributing to the rise in aggression, or perceived aggression, on the road, Wing said. Puget Sound native Cleo Floyd understands the frustration. He remembers when it took him 15 minutes — instead of an hour and a half — to get from his home in South Seattle to the downtown courthouse.